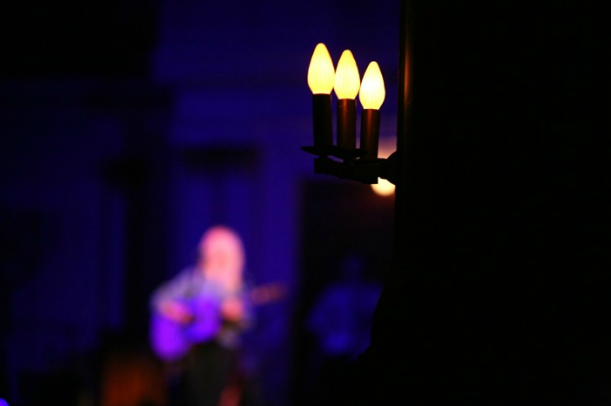 In spite of Laura Marling‘s admission that she doesn’t play encores, the audience couldn’t be faulted for standing and hollering at the end of the singer‘s set at the 6th & I Historic Synagogue on Sept. 27. At just 21, the British folk-rock musician put on a captivating show that wound smoothly through songs from all three of her full-length albums and even included one new, unreleased song. Marling, who frequently performs with nothing more than her voice and guitar, brought along a full band this time, complete with banjo, electric guitar, drums, horn, cello and upright bass. The singer took turns performing solo and alongside the band, holding her audience rapt with either arrangement, as Marling’s smoky voice reverberated across the pews and soared upward toward the dome of the sanctuary. In quieter solo moments, the only audible sounds were that voice, Marling’s deftly plucked acoustic guitar and the creaking of old wooden floorboards. Of course, those quiet moments were offset by walloping numbers in which Marling stood howling before her full band. The cacophony from so many instruments could have become muddled in such an intimate space, but instead it lent the songs thunderous power that seemed to shake the dust from the old synagogue’s ceiling. It was a show that worked on all emotional levels, full of rage and gorgeous, tear-jerking music, but also a refreshing sense of lightness. Although Marling didn’t return to the stage for an encore as she’d warned, she expertly left the crowd begging for more. ~ by castleqwayr on October 7, 2011.